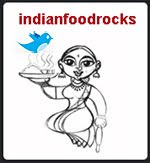 Indian Food Rocks: Lemon Pickle Update II - It's Ready! My lemon pickle is ready! Actually it was ready in 4 weeks but I haven't been able to post an update as this summer has been the busiest ever: birthday party for Medha, visitors, vacation and a huge backlog at work. It's not over yet cos Medha's school friend from New Lenox is coming to stay with us next week but two little girls should be easy to handle. Or am I expecting too much?! I was surprised that it took only 4 weeks to cook in the sun. But I attribute that largely to the intensity of the sun here in Colorado; we are at a higher altitude which makes the sun even more fierce. I also think that the unexpectedly hot start to this year's summer played a significant role. The usual cooking time in the sun is about 2 months. The juices are so thick that they stick to the lemon pieces. The thickened juice is called khaar in Marathi and a lemon piece are called limbachi phod. I washed and sliced one of the lemon pieces to show what the peel looks like when it is pickled and ready to eat. 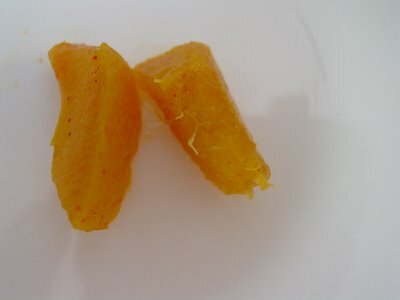 The thick peel is no longer crisp and no white parts are visible. Once the pickle has reached this stage, allow it to rest in a dark place for at least 3 days, preferably a cool cabinet that is not opened frequently. Once past this stage, store the pickle in smaller glass jars in the refrigerator. The advantage of storing it in small jars is that you reduce the chances of contaminating the whole batch if someone double-dips into it or a not-so-dry spoon is used while serving. Storing it in the refrigerator also makes it last that much longer. 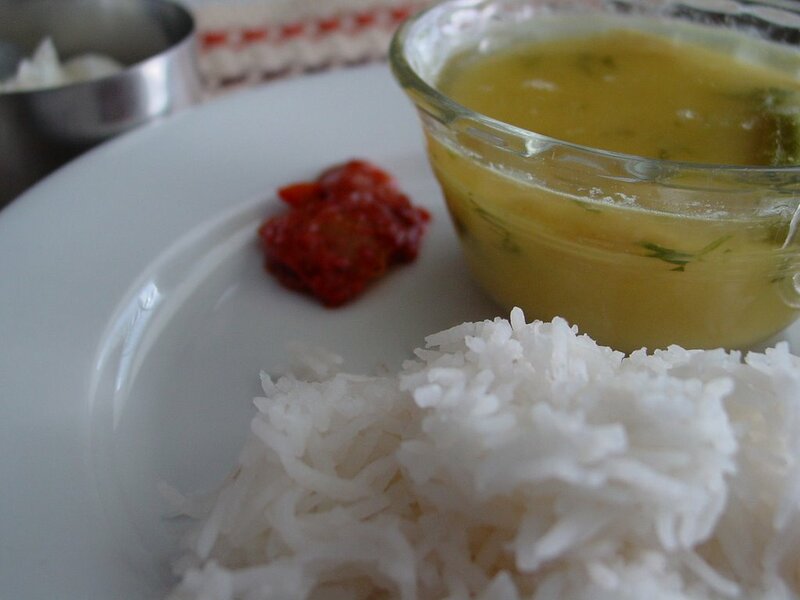 We love to have this lemon pickle on the side with meals, like we did with this simple meal of rice and thoy, a simple dal with lots of ginger. 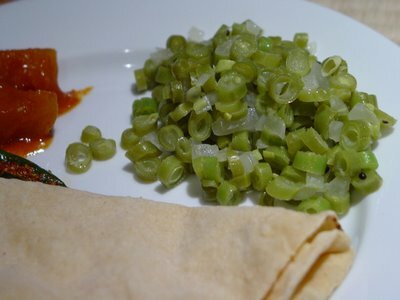 Or with phulki (roti) and farasbeechi bhaji, which was our simple dinner last night. We also love to have it with bagels. Yes! Warm bagels with cream cheese with a thin layer of lemon pickle. Delicious! If you make this pickle, I hope you enjoy it as much as we do! My next project is a lime pickle with ginger and green chillies, without oil and cooked in the sun. I hope to post the recipe soon! the lemon pickle looks gorgeous! btw, how did marag come out? I have all the ingredients for marag ready. It's almost 11pm and I am sitting here debating whether to do it now - I'm known for cooking lamb late at night - or early tomorrow morning. And tomorrow morning seems to be winning...I am really beat from the heat and major running around like a headless chicken today. Thank you for dropping by commenting on my blog regd. the CO trip. I did reply to your questions over at my blog. All I can say is you are one lucky person to be living in CO :). The lime pickle looks delish. I tried to make one a couple of years ago but that ended in total disaster. I "del.icio.us"ed your recipe and am gonna attempt to make it after we move in! The pickle looks lovely Manisha. I am trying to make lemon pickle here. Its been more than a month and the looks are not very satisfactory. I guess I should try keeping it in sun here. BTW..which jar did you use for it? My mom always used the traditional jars for pickles. Here I don't know which ones to choose :(. 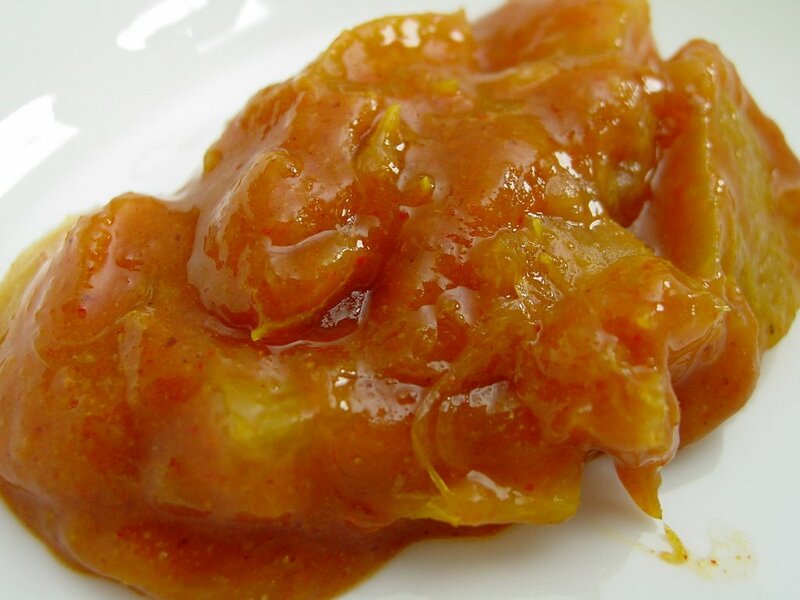 Lemon pickle looks absolutely delicious Manisha! My mom follows the same procedure for making this pickle and serves it to us when we have a fever or stomach flu. This is just fabulous. I like the no oil part best! I am planning to try it this week.Great! Manisha, I need to confess. I did make your lemon pickle. I didn't tell you when I started it because I thought I would surprise you at the end. :) It cooked in the sun for about a week, then we had a lot of rains and no sun for 5 days in a row! On the 5th day, I got panic, and heated up some oil, spluttered some mustard seeds and added to the pickle. There, I messed up your treasured recipe. :( I was worried if it would develop a mold or something like that. After I added the oil, I kept it in the sun for another week. It tastes so heavenly that I couldn't hide it from you anymore. :D Thanks for such a wonderful recipe. I will be trying it with bagel very soon. Great idea! Also next time, I will try it without oil. Kitchenmate, for once the thick rind did not bother me! L2C, my theory is that if I can do it, anyone can. The lime pickle with ginger and green chillies has just been set out in the sun for the second day. I am a little worried about it as it appears to have a lot of water content. It's been hot here but the sun has been playing hide and seek with scattered showers. So I don't know how it will pan out. But before I post on the lime pickle, I have to shout to the world about Nabeela's Hyderabadi marag. I hoped to do it last night but I couldn't get to it. Soon, though! Thanks for taking the time to answer my questions about your CO trip. Sounds like so much fun!! It will help me get up and about, too! KrishnaArjuna, you brought back many memories! When we were sick, my mother would give us dahi-bhaath with some lemon pickle (she would wash some of the spices off so that it would not hurt our tender stomachs). Literally translated, the thought behind it was to bring 'some taste back to mouth.' Most foods taste like cardboard when I am sick and this lemon pickle has a wonderful zing that helped perk me up for a bit! LG, yup! That's what I like, too! Let me know how it works out for you! RP, messed it up? No way! If it tastes great, you just created a delicious recipe! Indira of Mahanandi makes a lemon pickle that she rests for a few days before adding oil. When adding tempered oil to any pickle, you need to allow it to cool completely before adding it to the pickle. This is what I love about sharing recipes. You take an idea from someone and you tune it to something else that works for you. Please post some pictures soon! Awwww.. Loook at what you have accomplished !! Plizz to send in a box of the pickle to my residence. Have fun with your recipe. How did you know when it was ready? What jars did you use? That lemon pickle looks amazingly good! I would love to try to make a pickled something -- if you do the lime one, perhaps I'll play along. Thanks for the wonderful step-by-step photos too. Wonderful blog. 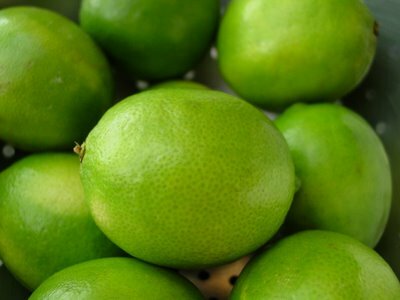 You do show a picture of limes here whereas in the original post you call for lemons. Hey Manisha... It's a week since I made the lemon pickle as per ur recipe & everytime I see the bottle basking in the sun, it makes my mouth water. Since this is my first attempt at making a pickle... How do u know it is ready?? Apologies for the lack of response. I currently have at least two 8 year olds at home (we acquire more as the day progresses) who become very active when they are together. I have been taking this opportunity to have some fun with them. I am exhausted but it's a real treat! Indianadoc, thayir sadam and lemon pickle = Bliss! Isn't it amazing how the simple things in life (and food) are what bring the most pleasure?! Ashwini, I keep saying this: if I can do it, anyone can. You have the sun in Scottsdale(? ), go for it! I used glass jars with glass lids. I was worried about the plastic liner that makes these jars air-tight, but they withstood the Colorado sun and did not impart that awful plastic odor to the pickle or jar. The pickle is ready when the khaar has thickened so much that it hugs the lemon pieces and the thick lemon peel has completely softened and there is no trace of the white rind in it anymore. I open up the jar at least once a week to taste it while it is still cooking. You can take this opportunity to adjust the salt/sugar/chilli powder to your taste as you go along. Lisa, welcome to IFR! I have started on the lime pickle. There are two reasons I haven't posted on it yet: I am a little concerned about the amount of juices released and how that will affect the whole process and a lack of time as I have visitors this week. I will post as soon as I have a better handle on both! Mythili, lime pickle is my (next, now) current project, therefore the picture. I have said as much just above the picture - I'm sorry if it is confusing. Maybe I should just take the picture off? Limes instead of lemons? I don't know the answer to your question as yet. As I said to Lisa, I am making a lime pickle with ginger and green chillies that is sitting out in the sun for the 5th day. I used 8 Persian limes and the juice of 1 lime but there seems to be a lot more 'water content' than there was in the lemon pickle. The ginger and green chillies may be the reason. Another couple of weeks into it and I will know whether limes work as well as lemons in a pickle cooked in the sun. Tina, welcome! I am so thrilled that you are trying this out! See my response to Ashwini as she had the same question. Keep me posted on how it's going! Oops. What was I thinking? I did add oil to the pickle, but no mustard seeds. Anyway, the taste is unbeatable manisha. I will post a picture soon. Nothing can beat a homemade lemon pickle,right?You seem to be like the Lemon Pickle Girl in the blogosphere:)Keep up your good work! RP, no worries! And the picture is gorgeous! Sumitha, you are so right! I used to make do with the bottled Priya's Lime Pickle when I ran out of the homemade pickle my sister sent me. No longer! Lemon Pickle Girl?! Now that's really funny! Shilpa, I'm sorry I missed your comment earlier! What does your lemon pickle look like? Does it have a lot of water content? Is it bubbling? Or does it look moldy? Why don't you post a picture or email me a picture [polarmateATgmailDOTcom] so that we can figure out what to do next. See my response here for type of jar. Try Wal-mart or Target for air-tight glass jars. Manisha, limbache lonche baghunach tondala pani sutatay!!! i have to try it and i also have the lemons handy but am wondering if now is a good time for the sun in the bay area? 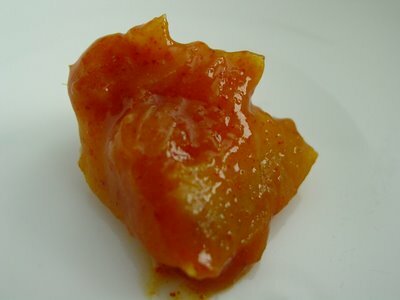 My lemon pickle was done in 4 weeks. My lime pickle, too. I love the taste of the lime pickle because it has ginger and green chillies in it. It has a different zing to it. I hope to be making a post on it within the next day or two so you have a choice which one you want to go with! The jar needs to get hot. There were days that my lime pickle got less than 4 hours in the sun because it was overcast and/or it rained. It seems like if you can manage that, it should work. My experience with weather in the Bay Area is very limited. When we were there last month, it was nippy in the mornings and early evenings. The sun came out every day though and the days were warm, except in San Francisco which was brrrrr! The heat wave ensued as soon as we left. I guess I am not much help with figuring this out, am I? I happened to see the recipe the other day when we were pickle dry! Inspired, I tried the recipe and myfirst pickling experiance was a great success thank you. Era, welcome! I'm glad it worked for you! I'm planning to get some Meyer Lemons this week to make the stove-top version as the sun may shine here in Colorado but there's too much snow on the ground currently!